Size Matters: This is a 16" fan. 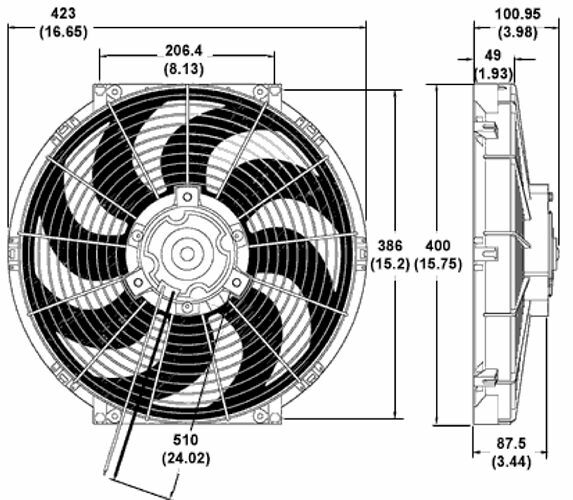 Unlike other electric fans, the size indicates the size of the blade not the assembly. High quality, long life motors. Available in 16" high performance. Super Quiet hi-flow S-Blade Design. . This 24 volt High-Performance 16" Radiator Fan is designed for military or ex-military vehicles with 24 volt electrical systems (Uni-Mog, Pinzgauer, HumVee, Land Rover, Volvo, etc.). Electric fans are ideal for O.E. replacement, supplemental or add-on cooling needs. 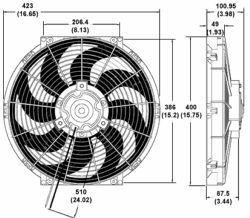 As a primary cooling source electric fans provide economical replacement for failed OE parts, with a 5-10% increase in horsepower and fuel mileage when replacing belt-driven fan assemblies. 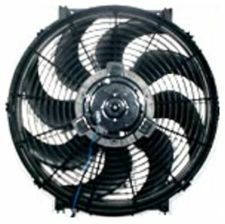 As an add-on cooling source electric fans provide increased air conditioning performance due to constant airflow across the condenser, with additional cooling in heavy traffic or while towing, or driving off-road.